Boat Inn, in Jamaica VT. Nice place. Jamaica, we turned North onto RT100. Zowie! and turned onto RT 2 to ride into Burlington. You go through some beautiful country, forests, and mountain passes on this route. Except for RT 2, everything is a postcard. Rivers, covered bridges, waterfalls, little towns, mountain views- it's great! Roads are in fine shape. This route doesn't go through any twisty mountain passes, but there are inclines, and declines. No traffic to worry about. You can't beat this route for places to stop, and enjoy the scenery, or for places to shop and eat. Lots of choices, and plenty of places to gas up, though look for gas stations once you start getting low. There's a few spots where there's a good 20 miles between gas stations. The only not so great part, is Rt 2, which I describe below. Note: Even though it was August, it was unseasonably cold and windy on our trip. It got down to 40 on Friday night, and maybe skinned 60 on Saturday. Because of that, we skipped the usual pilgrimage to the Ben and Jerry's Ice Cream Plant, just North of RT2 on 100. If you go up that way, and your lips aren't blue, it's definitely worth a stop. on April 2, 2011 1 out of 1 members found this review useful. A small group of us road from brattleboro ( RT 9 ) to Wilmington.Then (RT 100 ) to ( RT 2 ) in Waterbury. 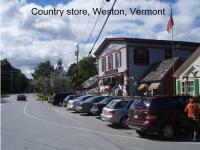 West on ( RT 2 ) and into burlington. What a great time, A 7 HR trip after stops at the flea market in Wilmington, food-fuel. A care free trip with lots of places to venture. on July 22, 2010 1 out of 1 members found this review useful. Lived in VT for 30 years and route 100 has always been great. Try leaving 100 in Hancock and take 125 to route 116 in Bristol. Great ride. on February 21, 2008 1 out of 1 members found this review useful. I give that a freakin' awesome :-) RT 100 is a great piece of road. We actually rode Rt 100 from Wilmington to Stowe, then 118 out of Stowe, making our way to Montreal. By far one of my favorite rides ever. VT Route 100 is perfect for a long relaxed ride. Pleasant curves, generally good road conditions, light traffic, excellent scenery. Highly recommended. Note: several relatively long sections in in Northern VT were under construction when we went through this summer. Not pleasant, but it should be temporary. on July 6, 2013 0 out of 0 members found this review useful. Do not take Rt 100 south of Montpieller it is all gravel for about 16 miles horrible!